Arena is a hexagon ping pong table with sensors to trigger LED lights and sounds. 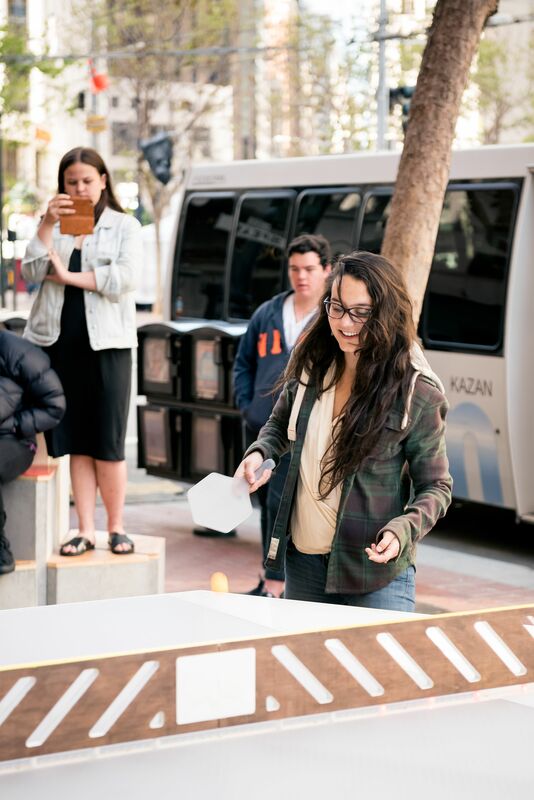 It made its debut at Market Street Prototyping Festival in April and will be available at the SF Design Week Hub with WestEdge SF June 4 and 5. We interviewed David Mayman from Gensler, who is one of the lead designers of Arena. 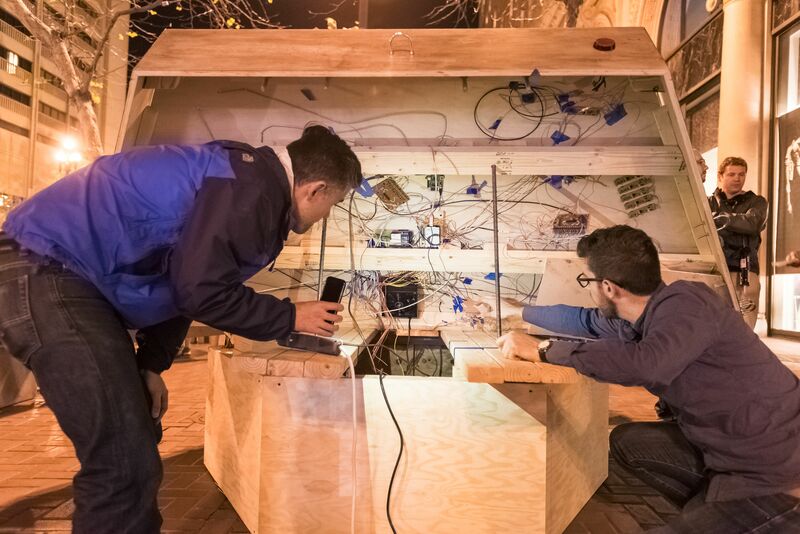 This project was first featured at Market Street Prototyping Festival. Tell us briefly about MSPF and how you got involved. Market Street Prototyping Festival was a three-day festival that featured over 50 interactive installations all across the Market Street. Market Street is undergoing a redesign in the next few years, and the intent of this festival was to test real concepts by designers, artists, creators, and inventors that facilitate successful public spaces. The Gensler team submitted a concept over a year ago, and were selected. How did the idea of Arena start at the first place? Arena came out of a series of gLabs at Gensler. These are events where we we invite anybody and everybody in the office to come share ideas over snacks and drinks. Because of the lack of limitations, these are guaranteed to be insightful and interesting. 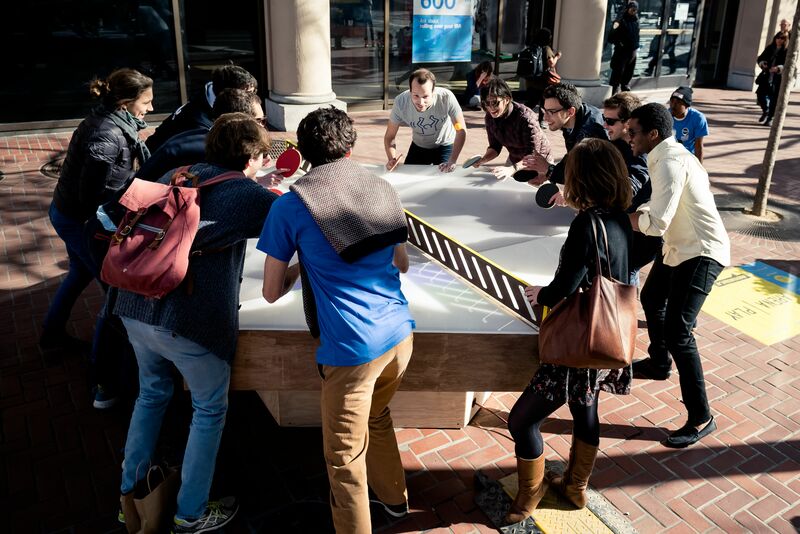 We wanted to create a universally accessible public experience, and the idea of a street game emerged. This soon became ping-pong because of how simple and common it is. The six-sided detail came soon after as a means of making it unexpected. Not until it was built and in use did we realize how engaging and contagious the hexagonal shape was. There’s no sideline. If you’re watching, you’re also playing. It seems like a wide range of creative efforts had to come together—light, music, electronics, sculptural aspect, etc. How did this work? I’ve been always intrigued how electronics can control physical products or environments, in an unexpected way. I’ve built a light-up drum set a couple years ago just for fun. That was a huge inspiration to this project. I’m interested in how you can take one experience and enhance an entertainment aspect of it by adding electronic elements, including sound and light. What I found throughout this project, design can take any form of creativity you want to take. Design is having a strong opinion about an outcome of your idea and using any means to achieve that vision. Therefore, anything can become design. In this case, I had this curiosity about how tech and electronics can enhance an experience, so I used a design-centric approach to solve the challenge. Intention was already set with the table. Point is what you want. In this case it was a table fueled by tech. Each piece of different creative efforts was approached through the same lens of intention and vision. Tell us about challenges. What were some things that didn’t go as planned or expected? Time was definitely a huge challenge. Towards the end, I spent close to 40 hours per week on this project—in addition to my full-time work at Gensler. It came down to a giant level of commitment. Lighting was very temperamental. The table was designed to have 96 individually controllable light channels, which required some careful planning and wiring. The method I used involved 6 daisy-chained TLC5940 chips within custom circuit boards I designed and built. This brought on complex and mysterious challenges (chips burning out, data not being passed properly) and I had to keep readjusting the plan with slight variations to resolve these challenges. I ended up going with one Arduino Mega to catch all the inputs, handle the game sequence, and build light patterns. Getting a lot of other ideas (e.g., an automated ball hopper, voice narration, twitter integration, scoring lights/buttons) to work together and not break each other was a fun challenge as well. Did you find anything interesting by observing how the public interact with it? Any fun anecdotes about people who’ve played with Arena? David Mayman [www.davidmayman.com] is a multidisciplinary experience designer driven by his passion for pushing possibilities and his curiosity of the unknown. He is driven to bridge the gap between technology and space through rich user-focused experiences.